Last week I ran away from home---for a day. It might not sound like much, but it was exactly what I needed at the time. After finishing revisions for the first in the Molly Malone mysteries and sending it off to my editor, I needed to "get my head" back into writing the second in the Molly mysteries. I'd started it last summer, but due to an intensive travel schedule I had only written five chapters. I was looking forward to getting back into the story, but I was also re-doing some of the plotline, tinkering. That's when the idea of escaping into the mountains came to me. Getting outside and into Nature has always stimulated my creative Muse. Whether it's a simple walk in the trees, sitting on top of one of the high ridges on the western edge of Fort Collins looking down into Horsetooth Resevoir, hiking in the foothills, sitting beside the Cache La Poudre River in the canyon of the same name----all of it nourishes me---and my Muse. Ideas start flowing and new ideas show up suddenly. So---I've gotten into the habit of "escaping" into Nature whenever I start a new writing project or pick up an interrupted project and start up again. This time instead of escaping into Poudre Canyon, I went to another favorite place---Estes Park at the edge of Rocky Mountain National Park. In addition to the gorgeous park, there are also scores of scenic hotels & lodges dotted all around the park and the picturesque little town filled with shops and cafes. I like to try new places whenever I'm "hit" with the Escape Bug, so this time I went to a resort I'd checked out a couple of months ago---Deer Creek Resort. 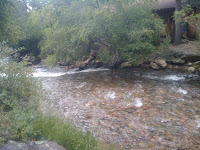 It's located on one of the main routes that run through and around Estes Park, leading up to one of the park entrances. The rooms are nice and comfy with all the expected furnishings, electronics, etc, but it's the setting that attracted me. You can walk right outside your door onto a wide green sweep of grass that stretches all the way from the buildings to the river bank. There are also benches, swinging benches, and Adorondack chairs scattered all around the greens, which make it perfect to sit and watch the river. It was Heaven. Truly. 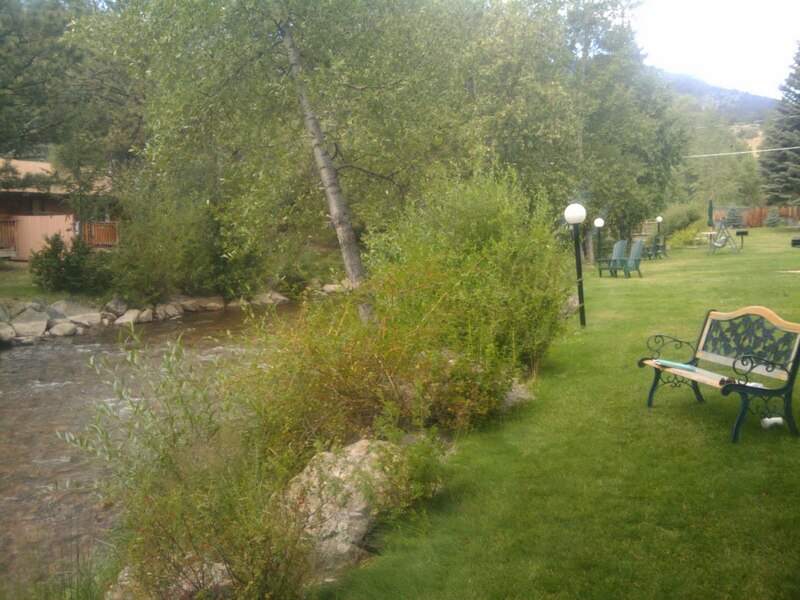 I sat in a couple of different shady spots that first afternoon and brainstormed for three hours before I went into Estes Park and tried a new cafe for dinner. The next morning, I was outside on the green beside the river again for another 2+ hours, getting more ideas. And-----getting my head back into the mystery novel. It was so productive, I've promised myself I'll be back for another "sleepover" in September and maybe again in October. I'll still be writing the second Molly mystery---so I'll need another excuse to escape. Do you have favorite places you like to escape to think or get ideas or simply relax? It has been a while since we have visited the Rocky Mountains. For relaxing, I love going on day hikes to waterfalls, but my muse is music. I put in my earplugs and the world disappears no matter where I am. O what a great idea, just to take a day for yourself and relax, let the ideas come to you instead of chasing them. Nice pics also. a gorgeous public garden in my neighborhood, I used to visit often when my boy was little, but I have not been there in many years. Will definitely go in the fall because there is a view across the river of the Palisades, the river and the autumn leaves. Sounds like a paradise, Maggie. I'm glad you had a chance to get away. I find the ocean comforting and stimulating at the same time. Sounds wonderful. Colorado is on my list. And right now, we are in the Canadian Rockies on our own escape to nature. Been hiking, watching wildlife, seeing some amazing scenery (the lakes are incredible) and even walked on a glacier yesterday. Overall, a great escape and we have a few more days left to enjoy it before the long car ride back home. I like to hop in the RV and just go somewhere, but I always end up with hubby and 4 dogs. Just let me get in my jeep and drive and I'm happy. I've had it for two years and have over 43,000 miles on it. Yup. I drive alot. Sandy---Music is my next Muse. Always works. You can feel those brain cells unwind---especially w/Bach. Aurian---Sit and let the Muse come to you rather than chase after it. I like that image. Debra---YOu should go again. Treat yourself. Kate---The ocean does it for me, too, Kate. I love being around water. But I also feel the same way just looking out at the mountains, esp the Rockies. Linda----That sounds wonderful. Love it. ev----Boy, you have been driving, girl! Good for you.